In Richard Attenborough’s biopic Chaplin, Charlie chides himself for his prosperity during the Great Depression. He said, “Terrible things have happened out there since the crash, millions of Americans have been robbed of their right to work, machinery’s replacing manpower and I’ve said nothing, shame on me.” The result was the intelligent and insightful Modern Times. The film finds the Tramp and Paulette Goddard’s orphan girl enduring misfortune and misunderstanding in the pursuit of an honest living. The multi-talented Charlie Chaplin makes this deft analysis of industrialization, labor rights, the Great Depression, and the plight of the common man in America without uttering a word. This is not the first examination, literary or cinematic, of the human industrial complex. 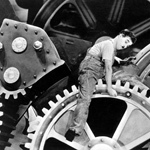 Charles Dickens’ novel Hard Times and Fritz Lang’s 1927 masterpiece, Metropolis addresses the relationship between labor exploitation, profiteering and social welfare. The difference is Hard Times explored England’s industrialization and Metropolis is a German expressionist exploration of these issues set in a future world. Chaplin said, “Humor heightens our sense of survival and preserves our sanity.” As with his preceding movies, he made Modern Times to both cheer people up and say something about the circumstances he witnessed. Motion pictures with sound (a.k.a., talkies) eliminated silent films years before, but Chaplin unwaveringly maintained his allegiance to silent film despite potential economic risks. Nevertheless, he still made money and maintained a following. In Attenborough’s biopic, Chaplin remarked to Douglas Fairbanks Sr., “Can you imagine the Tramp talking?” When Fairbanks called [talkies] the future, Chaplin replies, “Not in my lifetime.” In Modern Times, the Tramp refuses to speak and Chaplin still primarily uses the silent techniques of cinematographic effects, music and editing to advance the plot and make its statement without dialogue. Cinematographers Ira Morgan and Rollie Totheroh shot the film at 18 frames per second (fps) using a process known as undercranking. Projected at a standard speed of 24 fps and combined with Chaplin’s music, the fast, exaggerated, and cartoonish action points out the foolhardiness of not only labor management philosophies of the era, but of social conditions and political attitudes. In the opening footage, editor William Nico combines (intercuts) scenes of cattle herded to the killing floor with factory workers reporting to their stations. The sequence illustrates that big business’ attitude is that human labor is a plentiful, unremarkable commodity. The only voice we hear is that of the President of Electro Steel Corporation. He is a shiftless overlord who speeds up the assembly line, considers eliminating the lunch hour to goad greater productivity out of his workers, and won’t even let the Tramp enjoy a peaceful smoke during a sanctioned break. The president conversely “earns” his executive salary assembling jigsaw puzzles (the depression era equivalent of computer solitaire). This makes a joke of management attempting to “do their job” merely by rearranging workers. Chaplin’s boss fails to lead by example. Through him, Chaplin finds fault with executive self-importance and the absence of leadership. He further denounces the specious devotion to efficiency that deprives the workers of their rights and welfare, while still failing to boost productivity in any material sense. Investing only this despicable character with a voice also demonstrates Chaplin’s contempt for the talkies. With the Tramp’s arrest and incarceration for unwittingly leading a group of marching demonstrators, Chaplin lampoons the Red Scare and fear of organized labor as a harbinger of communism. He traipses in and out of prison and he gets and loses jobs. In one such instance, while working as a department store night watchman, he feeds himself, the gamine, and former co-workers turned robbers from the lunch counter and uses store property with impunity, but not without the consequences of another arrest. The lunch counter scene suggests people must survive by any means necessary and that the Tramp does not have the luxury of skating his way through life. The Tramp’s punishment indicates a double standard in society. That standard condones the privileged exploiting the poor, but condemns the poor for reciprocal behavior. That the Tramp repeatedly lands in prison and fares better there suggests that jail is a preferable place for the downtrodden to ride out the Great Depression. On a lighter note, as the self-appointed protector of the gamine, a minor, Chaplin used the Tramp to poke fun at his real-life penchant for hooking up with significantly younger women and acting like a father figure. On the cusp of enunciating as the singing waiter, the Tramp loses the words to his song. Although he vamps singing in Esperanto (a made up language), Modern Times retains its silent film sensibility by appearing to add in a musical number, much like the Technicolor drop-ins in otherwise black and white movies. This also emphasizes Chaplin’s pantomime instead of the lyrics or dialogue. The scene embraces the show business adage, “show, and don’t tell” and proves one of the funniest and most enduring scenes of the movie. Ultimately, comedy allows Chaplin to embed a social message behind the slapstick shenanigans of Modern Times without seeming preachy. Because a buffoon shines a light on society’s foibles, its rhetoric works subliminally rather than on a direct level as that of Metropolis. Although the message is essentially the same, the latter seems heavy-handed and bombastic by comparison. Modern Times simultaneously pats us on the back and says everything will be OK as long as we keep trying.